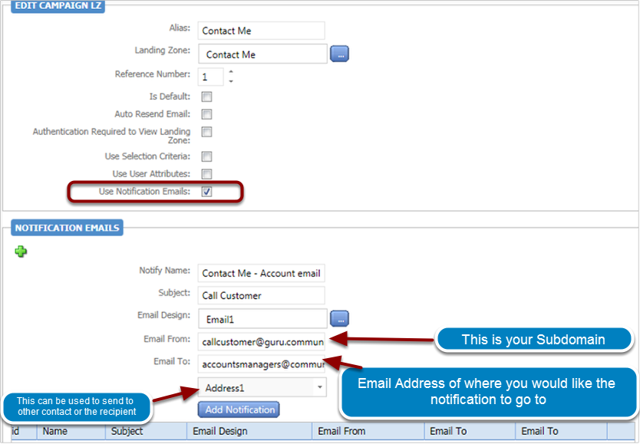 These are emails that are triggered to send once a contact clicks through to a landing zone. These are not the same as follow up actions since follow up’s can only be sent to contacts. Notifications can be sent to a contact also but can also be sent internally to let you know that a contact has carried out an action. This happens as soon as the action is complete. Contact clicks a link that says ‘Please send me some more information on this topic’. This can then send a single email back to the contact, not a full campaign. Contact clicks a link to say ‘Please renew my subscription’. This can then generate an email back to the contact thanking them for their renewal, whilst also emailing the accounts team all of the contact’s details so they may raise an invoice. Contact clicks a link that says ‘Please contact me’. This then sends an email to the account manager asking them to call their customer. 3. Insert a table with 3 rows and 2 columns. 5. Feel free to style this email (Fonts etc) however you like. The trigger is an action that is attached to a landing zone at campaign level. This will also include the email that should be sent once that particular landing zone has been hit by a contact, As well as details of who to send to and subject line etc. 1. Open your campaign and go to the landing zone tab. 3. Click ‘Add’ next to notifications grid. 4. Fill in the form, selecting the notification email you created & Apply. 5. Now send yourself a test.